OCC 5-free polish in Radiate. tenoverten polish in Austin. All tenoverten polish is formulated without formaldehyde, DBP, toluene, formaldehyde resin, camphor, ethyl tosylaminde, xylene, and parabens, making it 8-free. tenoverten products are also cruelty free, vegan and made in the USA. 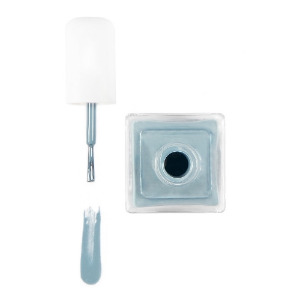 JINsoon 5-free Polish in Charme. On one of my very first days of business school, after I had already made it obvious to my entire class that I was obsessed with cosmetic safety, one of my classmates asked me if I had heard of the second year student who was doing an Independent Study on the exact topic. The following day, I got an email from Rachel Peterson, a blonde bombshell chemical engineer from MIT who was also a cheerleader for the San Francisco 49ers (my home team!) and is currently finishing her MBA at Harvard Business School. Oh, and she is dedicating her semester to learning about the ingredients in our beauty products and coming up with an action plan to change the industry for the better. I didn't believe she was real. Rachel is real. And she is beautiful and inspiring and she wants to make the safest and best products accessible to everyone. And she actually knows the science behind the issue. She even carries around notecards with drawings of the chemical structures of common substances found in cosmetics. To say she is our #girlcrush is an understatement. Rachel is our very own #GIRLBOSS. Today, Rachel was crowned the "Lovely Lady of the Day" by Sport's Illustrated. You can see the full spread here. Stay tuned for more from Rachel and her perspective as a real scientist!